Tyropita (pronounced Ti-ROH-pee-tah) is usually made made with layers of buttered phyllo and filled with feta. 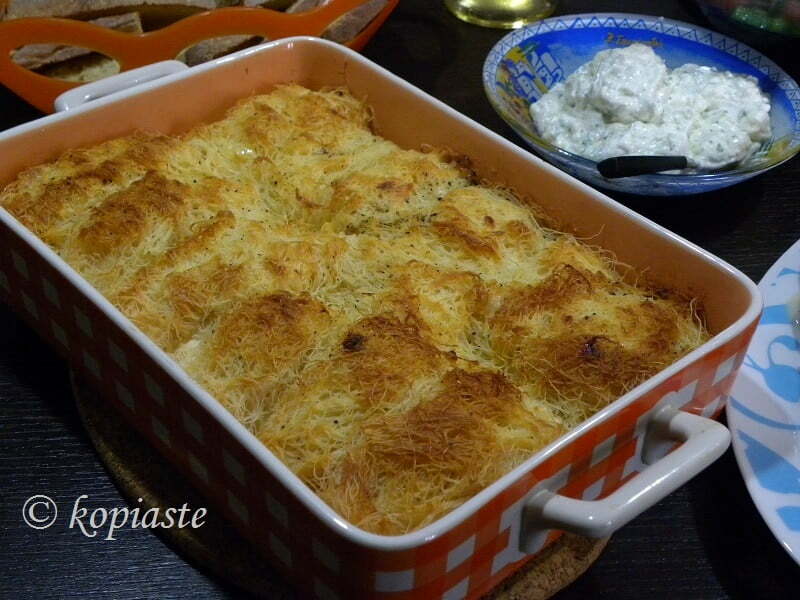 In this Tyropita I used Kataifi and five different kind of cheeses. You can add only feta if you prefer and other cheese that melt well when baking. Kataifi (pronounced kah-tah-EE-fee) is a kind of pastry made with dough similar to phyllo pastry, but which passes from a machine and comes out in strands, that looks like angel hair pasta. However, kataifi is soft and can be handled without crumbling. Although kataifi is usually used for making sweets which are filled with nuts and cinnamon and then bathed in a syrup, there are, however, a few savory recipes using kataifi in savoury recipes and tyropita is one of them. This tyropita is rich in calories, so some times I try to keep them as low as possible by using low fat milk and some low fat cheese. 850 grams feta cheese (or mixed with a variety of other cheeses such as graviera, kasseri, halloumi or anthotyro (similar to ricotta) etc. You can substitute with any low fat cheese. Crumble the feta and mix with other grated cheese of your preference. Nothing else is added in the cheeses. When it is baked it is served hot cutting pieces with a spoon. Preheat oven to 180oC / 350oF (170οC / 338oF fan) and bake for about 30 - 40 minutes or until golden on top.